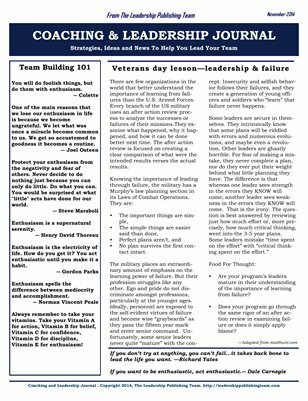 Written specifically for busy leaders, The Coaching and Leadership Journal gives you the latest strategies in a concise, quick-read format. You are bombarded with an information overload on a daily basis. This is where the Coaching and Leadership Journal comes in. You don’t have to waste your time searching and sorting through useless information. Like a debriefing, each month you’ll get the most pertinent information and tactics which help you stay ahead of the competition.